Few builders have the historic pedigree or earned such respect as this legendary builder. Yacht building has not been saved from the clinical process associated with mass production. it is nice to know that the Hallberg-Rassy yard existed even in the days when boat building still meant wood and individual yachts. No manufacturer could have carried on with traditional ways when the force of economic change took over the marine industry. Halberg-Rassy adapted and continues to adapt, holding on to core values. Over time, Hallberg-Rassy needed to adapt or die. Better than most they adapted into a specialist builder that still produces beautiful yachts with an emphasis on retention of value. This specialisation inevitably requires a great deal of careful thought relating to market positioning. Halberg-Rassy has achieved a balance between production of beautiful yachts at a reasonable price, while maintaining the need for longevity in selecting materials to be used in costruction. The company history began with Harry Hallberg back in 1943. Harry Hallberg, the person is referred today as Hallberg-Rassy Varvs AB, was initially two boatyards. Harry Hallberg, lived between 1914 and 1997, he started his boatbuilding career as a young boy of just 14 years old. Harry began constructing boats made of wood when he was 29. He opened his boatyard at Kungsviken in 1943 on the island of Orust in Sweden. In the beginning, he built wooden boats more or less by instinctive feel rather than any hard and fast design. Customisation possibilities were debated with customers and solutions were reached. Yacht blueprints hardly existed at all, as this was a yard based on the passion of yacht building through feel and touch rahter than the technichal way. Foundations of knowledge were learned by hand and not by drawings. The first yacht to be built in a series was the Folkboat. Harry also had great success with Kungskryssaren (Swedish for the king’s cruiser). This cruiser was not to be confused with the Finnish King’s Cruiser. The Kungskryssaren was constructed in the mid-50’s. King Fisher had nothing to do with Hallberg-Rassy. Harry Hallberg’s most distinguished contribution to the marine industry was his understanding of using GRP to build yachts in a series. During 1963 he was one of the pioneers in the serial production of yachts using GRP. Harry was also the first successful Yacht builder of GRP hulls with a wooden superstructure in a series. His P-28 Yacht was a great accomplishment, and in many ways a forerunner to what was to follow for years to come. Hallberg had early success with exports. Most of the first 100 P-28 Yachts were sold to America. Christoph Rassy was born in 1934,he was brought up in Bavaria Germany by a lake called Starnberger See. As a young man in his spare time he was building models of boats. He then went on to build a few real boats. Christopher wanted to learn about boat building and became an apprentice to a small yard who made wooden boats, they were also based in Southern Germany. Soon Christopher wanted to build and larger sailboats. He wrote to many Swedish boatyards, requesting work. One yard got back in touch saying they would welcome him at the yard. In 1960 Christoph moved with nothing other than a bicycle to Nötesund, Sweden. It all started in a shed for both Mr Hallberg and Mr Rassy. Although Halberg and Rassey never worked together as partners. While working at Kungsviken boatyard Chrisopher found needed to stretch cash flow, the young Mr Rassy then built boats for himself in his spare time. He raced these boats, won, and then sold them for a profit. Soon Christoph Rassy yearned to strike out with his own company. Luck was to play it's hand, this coincided with a boat builder's move of premises. This builder was Harry Hallberg. In the mid-60’s boatyard at Kungsviken had become just too small for Harry Hallberg and so he built new premises in Ellös. This yard was about 10 kilometres southwest on the island of Orust.Two Hallberg-Rassy Rasmus 35 were first built in mahogany. Harry Hallberg and Christoph Rassy were competitors from 1965 until 1972. The first boat to become part of a series was the "Rasmus 35", designed in 1966 by a leading Swedish yacht designer, Olle Enderlein. The first two yachts were built in mahogany taking one year each to build. This yacht was in many ways ahead of its time, a pioneer to long-distance cruising with a centre cockpit protected by a windshield. This centre cockpit design of the Rasmus 35 with a powerful engine has remained with the Hallberg-Rassy yachts to this day. When the Rasmus was presented to the public, many eyebrows were raised. Some just thought the yacht was much too large. Remembering please, this was back in the day when 35 feet was regarded as an enormous yacht. Besides, they, who thought they knew best had to accept a yacht with a windshield, a combination never seen before. Today it is simply taken for granted on a quality cruising yacht. At the same time, Harry Hallberg built his smart attractive yachts at a reasonable price. This is thanks to model production and GRP hulls. The Mistral 33 yacht 216 were built between 1966 and 1975. The two yards had become one brand Hallberg-Rassy, and the future was set. Harry Hallberg decided to retire from work in 1972. Once again, in the history of this brand fate had intervened when Christoph Rassy went looking for more extensive premises. Ellös who produced the "Mistral 33 Yacht" featuring a superstructure of mahogany and the 1/2 ton "Mistress 32", that was the best-selling "P-28" and the small yellow 24 ft "Misil II". Olle Enderlein designed all the yachts, that is except for the P-28 which was designed by Harry Hallberg himself. During 1972 the Rassy yard in Kungsviken purchased Harry Hallberg’s yard in Ellös. As the Hallberg brand was the most well-known with its four yacht designs, the new company was to be called Hallberg-Rassy. Harry Hallberg and Christoph Rassy were never actually business partners. 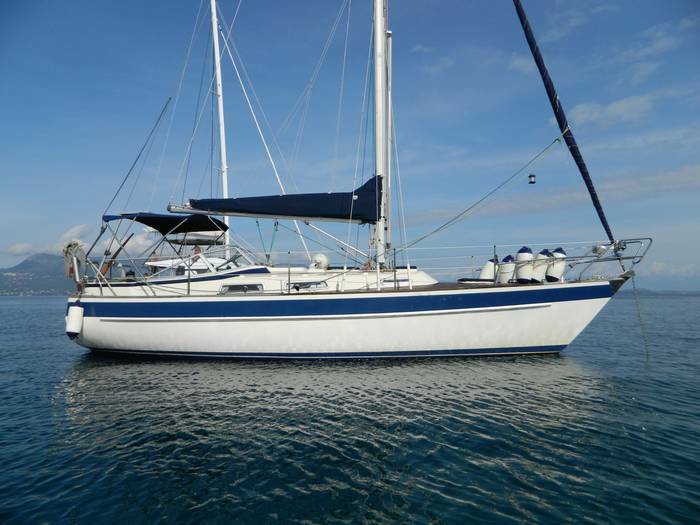 The bestseller was the Monsun 31 Yacht. 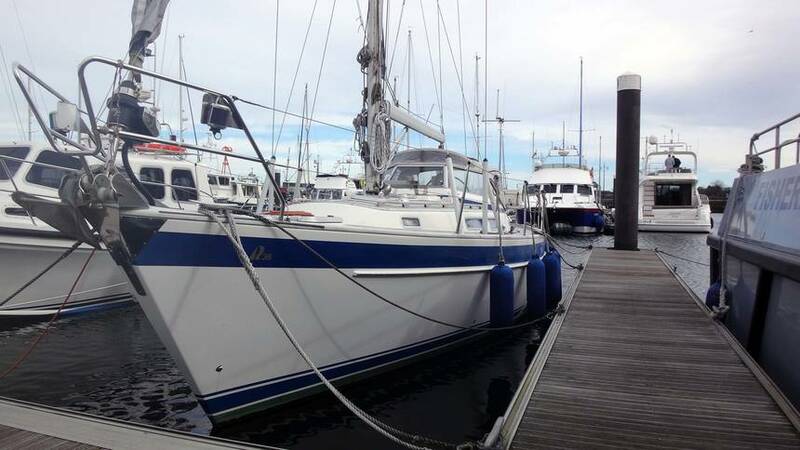 So it was a great success, the first design under the brand of Hallberg-Rassy was the Monsun 31 created in 1973. 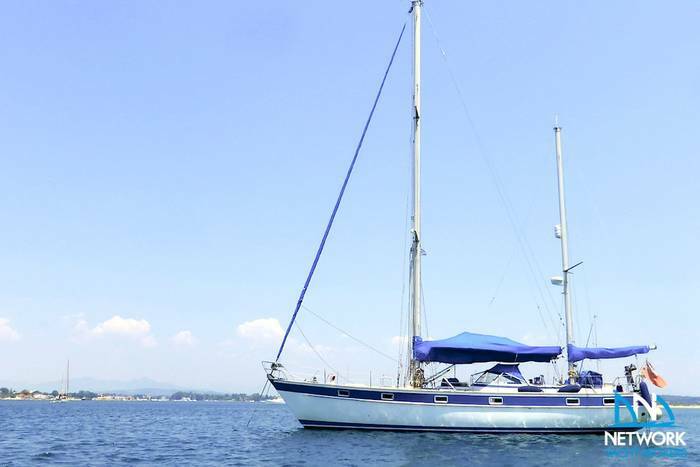 Demand for the Monsun was exceptional, and so the yard was doubled in size in 1975. 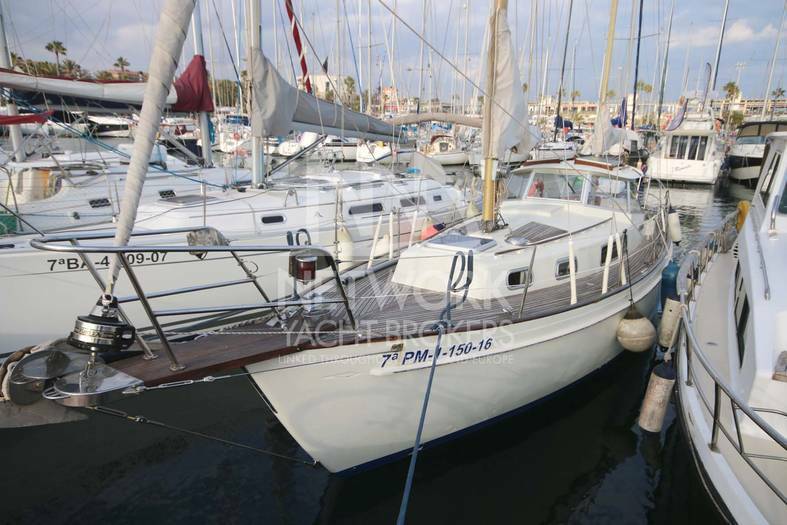 Hallberg-Rassy 41 - Flagship of the brand, this Yacht quickly became a trendsetter. Built between 1975 and 1981 the yard build over 100 Yachts. It's not difficult to understand why this yacht was so successful. It was one of the first yachts to have a proper walk through into the aft cabin. This fundamental centre cockpit principle is still followed to this day. 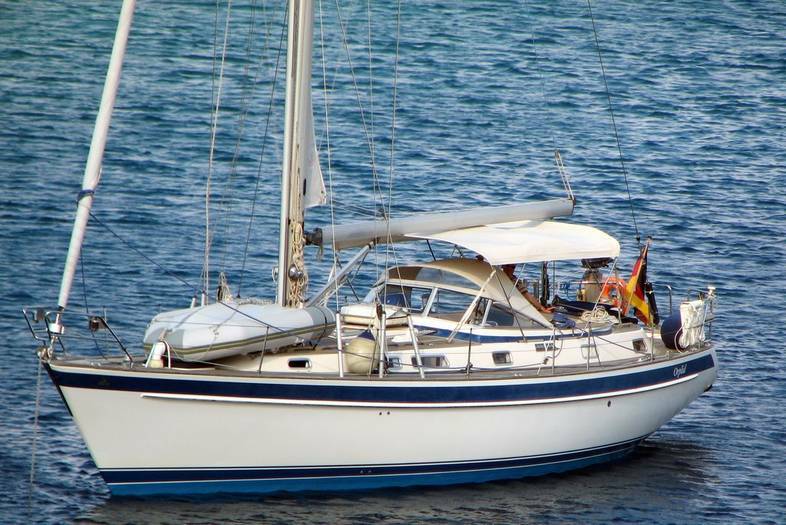 The Hallberg-Rassy 41 was a true long distance cruising yacht with the keel and rudder separated. Hallberg-Rassy 382 - the final Enderlein yacht design In 1984 along came the Hallberg-Rassy 382. This was the last Olle Enderlein design and the very last model with an encapsulated keel. 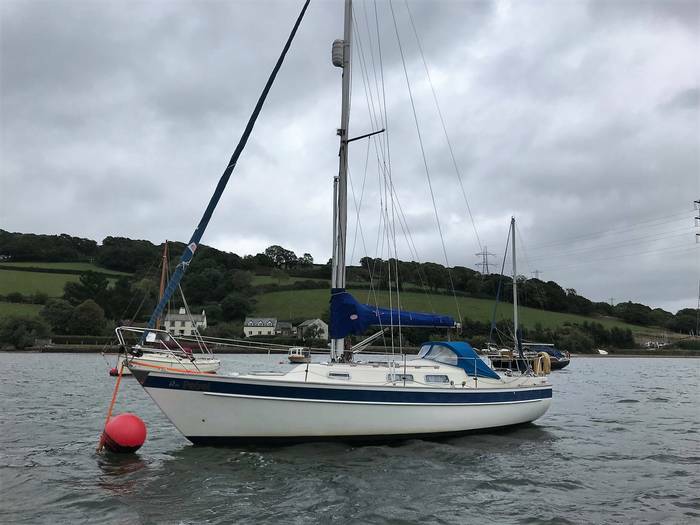 For some, this was considered to be the end of an era, as it was thought bolting on a Yacht keel to yachts not to be as strong a solution as encapsulation. 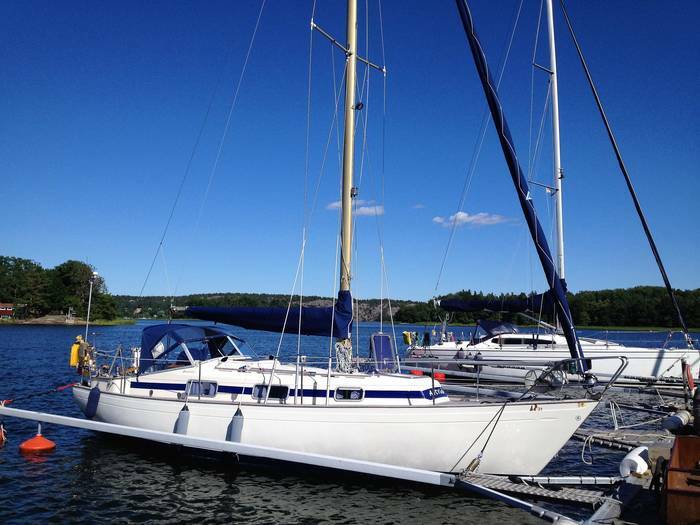 The first Hallberg-Rassy designed by Germán Frers was the Hallberg-Rassy 45. 71 Yachts were built between 1988 and 1996. Launched in 1988 this yacht was a trendsetter. 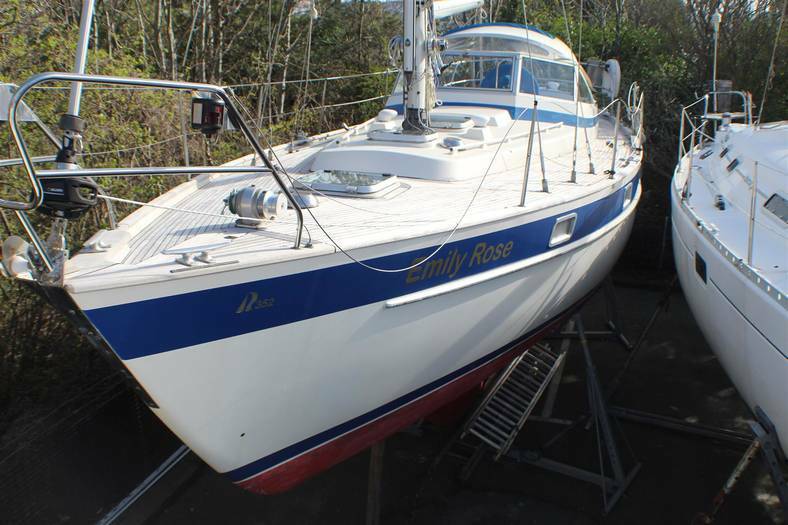 When introduced the Halberg-Rassy 45 was the first yacht of its size to incorporate an external lead keel. This keel was supported by a sturdy hull stiffener running along the hull and across the beam between the floor and keel. Having a reinforcement installed in this way reinforces the yacht hull construction considerably. Additionally, hull insulation was introduced using a Divinycell foam core. This foam not only insulates from heat and cold, but it also ensures an even stiffer hull with an excellent smooth internal characteristic. This smooth finish was much prefered to the visible stringers of the older generation of yachts. 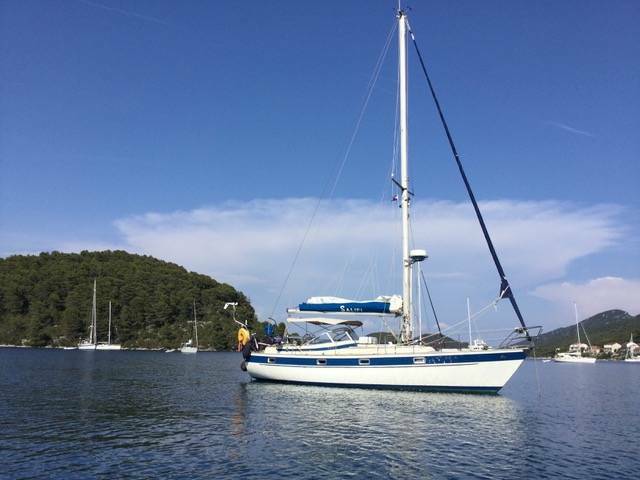 This yacht was a winner with customers from the outset. It claimed overall victory in the ARC race in competition against yachts with an excellent pedigree. The Hallberg-Rassy 53, at her time the flagship of the Hallberg-Rassy fleet New 53 ft flagship the Hallberg-Rassy 53. 82 boats were built during fifteen years, from 1992 until 2006. The Halberg-rassey yard continued to thrive and issues a newsletter each year after 1995 which we have extracted information and placed in our manufacturer news section. It all started 73 years ago in the heart of the Swedish archipelago. 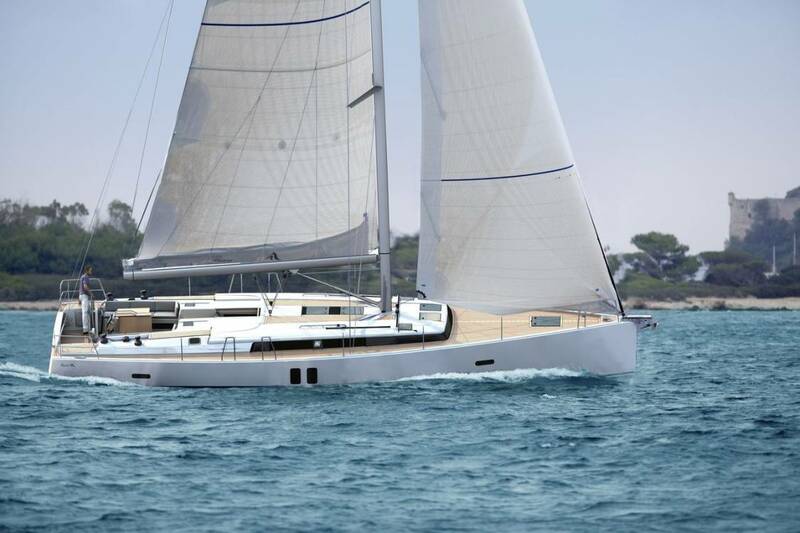 Since then over 9,400 Hallberg-Rassy yachts have been delivered to customers over the world. The yard still prides itself on delivering yachts on time, making customer satisfaction a major focus.